Special Fundraiser… the committee's students are performing a fundraising concert at St. Pete's HARRRP, 705 Main East. Amazing young musicians to support – Free Will Offering. This year we have added Strings and have increased the festival run from 5 days last year to 10 days this year. April 17 to 27. Venues are all in the Locke Street area. There is a $3.00 fee to see these wonderful performances. We hope that the community will come out and support these performances. Hamilton had been without a festival for about 15 years. Co founder, Diane Manojlovich (Mano Music Studio - piano studio) and myself Tom Oliver (Voice Concepts Music Studio) brought 10 colleagues together to re introduce the festival to the community. Last year about 30 private music studios were represented and this year over 60 private music studio are represented with approximately 600 entrants. We are thrilled to have the blessings of the Mayor’s office and many sponsors, including the Hamilton Duet Club, and Judy Marsales Real Estate Ltd. This Saturday April 15 at 7:30 pm, the committee's students are performing a fundraising concert at St. Pete's HARRRP, 705 Main East. Free Will Offering. We are close to raising 10 K for scholarships. 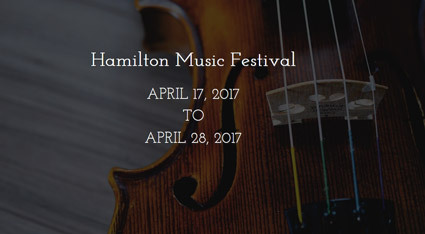 NOTE: Hamilton has also been selected to host the PROVINCIAL MUSIC FESTIVAL this JUNE. We are absolutely thrilled that our inaugural year had such an impact. The Provincial competition will be housed in ten venues throughout Hamilton downtown core. It will feature students from regional festivals selected by adjudicators to compete. It is such an honour and at the same time a huge project to organize. Diane Manojlovich has offered to organize the event. However, our Hamilton Music Festival Committee will all volunteer to help her with this enormous task. St. John's the Evangelist "Rock on Locke" on Locke Street. Erskine Presbyterian Church - Pearl Street. Saturday May 6, 7 pm at the Grand Hall, Conservatory of the Performing Arts, James St.